They carried their boats onto trucks to get there and braved the filthy, swirling waters before most other rescuers arrived. Now hundreds of fishermen are being hailed as the heroes of India’s Kerala floods crisis. One man got on all fours with his face in the water so women could step on his back to board a rescue boat. Others had to suffer abuse from people angry because the official rescuers took so long. India‘s Tourism Minister K.J Alphons has called the fishermen the “biggest heroes” of Kerala’s disaster and state Chief Minister Pinarayi Vijayan has announced a cash reward for each of them and a ceremony to pay tribute. 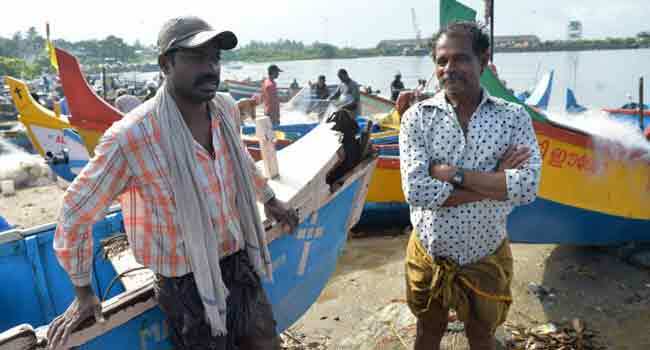 Robin Richard and other fishermen from ports like Kollam are suspicious. Their community is disparaged by many in Kerala. Now they just hope the authorities keep their promise to pay for damage to boats and the fuel they used to rescue several thousand people. “When we suffered in a cyclone last year no one took notice of our plight but now everyone’s attitude has suddenly changed,” Richard, 42, told AFP. Hundreds of traditional wood and fiber boats left Kollam, a tourist destination on the Kerala coast, after appeals for help were made on Wednesday last week, Richard said. They were pressed into service in some of the worst flood zones of Kerala, where about 420 people overall have died in monsoon rain in recent weeks. “At least 150 fishing crews were working non-stop here at the peak of rescue operations,” an official in Alappuzha district, one of the worst-hit, told AFP. Michael Solomon, 56, a Kollam fisherman for almost four decades, told how he and colleagues lifted their six-meter-long (20 feet) boats up onto a road to be loaded on trucks and taken to flood zones. “We have been going into the real sea since we were children, so these waters were nothing,” he said. But many boats suffered damage after hitting cars and other obstacles on flooded roads. Some crashed into houses. “I hope the government keeps its word and gets the boats repaired. An operational boat is our only source of livelihood,” he added. Manoj Francis, 40, who works with Solomon at Kollam beach, said he had been shocked when he first saw the flooded houses. “There was extensive damage. People were at the top of their houses and at many places entire buildings were under water,” he told AFP. The flooded villages and towns became a vast maze and the fishermen often operated alone for hours on end. They have been widely hailed on social media. “We call them ‘fisherman’ but they are ‘Supermen’,” wrote Rajiv B. Menon on Twitter. “Some of them travelled 120kms to Chengannur to save lives of people stranded, facing death, due to the deluge. Take a bow,” he added. Many rescued families have told how the fishing flotilla reached them before any official help. “They arrived like saviours. No local government officials came to us or gave us any warnings before that,” said Ravindran Achary, the 62-year-old head of a nine-member family, now living with other floodrefugees at the Union Christian College in Kochi. He said the group, which includes five small grandchildren, only escaped their house because a fishing boat arrived out of the blue in their urban neighbourhood in Kochi. Despite the praise and attention, some fishermen said they were not universally welcomed. “While most people were generally happy to see us some of them were understandably angry and agitated,” Richard said. “I think some of it was taken out on us. Some of us were abused, with people complaining why it took so long,” he added. Richard, Manoj and Solomon hope the government and Kerala’s people do not forget their efforts as water levels fall and life slowly returns to normal.